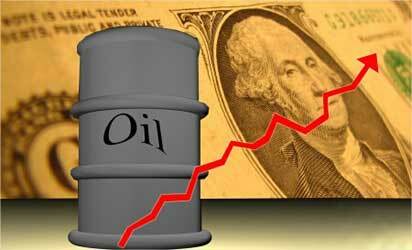 Petrol and diesel prices look set to be hiked after Finance Minister Pranab Mukherjee ignored calls for its reduction in customs and excise duty to contain the impact of spurt in global crude oil prices that have touched a two year high of $110 per barrel. Mukherjee in his Budget for 2011-12 left customs duty on crude oil unchanged at 5 per cent and that on petrol and diesel untouched at 7.5 per cent. Excise duty on petrol will remain at Rs 14.35 a litre and diesel at Rs 4.60 per litre. In fact, he refrained from mentioning the impact of rising crude oil prices on an economy which is 75 per cent dependent on imported oil to meet its energy needs. State-owned IOC, BPCL and HPCL are currently losing about Rs 2.25 a litre on petrol, a fuel that was freed from government control in June last year. Oil firms had withheld raising petrol prices in anticipation of a cut in customs and excise duty in the Budget for 2011-12. 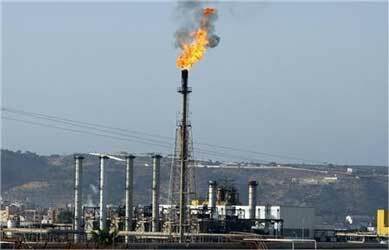 Image: A view of a liquefied petroleum gas refinery. Similarly, the oil firms currently sell diesel at Rs 10.74 per litre lower than imported cost and in absence of a duty cut, an increase in prices is the only option left to meet rise in cost of raw material (crude oil). Oil Minister S Jaipal Reddy had last week stated he would take the case for an auto fuel price hike to an Empowered Group of Ministers (EGoM) headed by Mukherjee after the Budget. The timing of the hike remains to be seen as the government may be jittery of raising prices when Parliament is in session. The Budget session of parliament goes for a 3-4 week break from March 18 and rates may be hiked then. Besides petrol and diesel, the oil firms lose Rs 21.60 a litre on PDS kerosene and Rs 356.07 per 14.2-kg domestic LPG cylinder. The only other way to avoid a fuel price hike would have been higher government subsidy. But Mukherjee has provisioned only Rs 23,640 crore (Rs 236.4 billion) in 2011-12 as oil subsidy, lower than Rs 38,386 crore (Rs 383.86 billion)of current fiscal. The budgetary provision for the purpose during 2011-12 will be less than one-fourth of the projected Rs 105,000 crore (Rs 1,050 billion) revenue loss that state oil firms anticipate on selling diesel, domestic LPG and kerosene next fiscal. The revenue loss projected for 2011-12 fiscal is higher than Rs 103,292 crore (Rs 1,032.92 billion) under-recovery in 2008-09 when global crude oil prices had touched $147 per barrel. Of this, the government provided Rs 71,292 crore (Rs 712.92 billion) in cash and to contain impact also lowered customs duty on crude to zero and that on products to 2.5 per cent. At current prices, the oil firms are projected to lose Rs 76,559 crore (Rs 765.59 billion) in the current fiscal, half of which is to come from government by way of cash compensation. 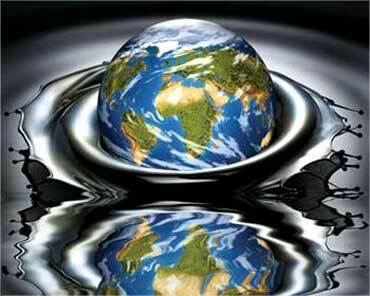 Further, one-third would be contributed by upstream firms like ONGC and the remaining absorbed by oil marketing firms. Of the Rs 46,963 crore (Rs 469.63 billion) revenue loss due to under-recovery during April-December 2010-11, Rs 21,000 crore (Rs 210 billion) has come as cash assistance from the government while another Rs 15,654 crore (Rs 156.54 billion) was provided by upstream firms like ONGC. 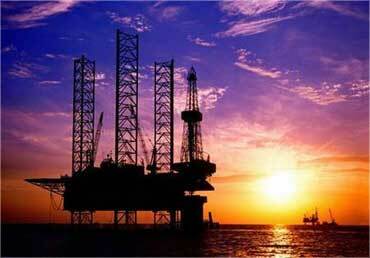 The remaining Rs 10,309 crore (Rs 103.09 billion) has been absorbed by oil marketing companies (OMCs). In 2009-10, Rs 26,000 crore (Rs 260 billion) in cash assistance was provided by the government to make up for over 56 per cent of the total Rs 46,051 crore (Rs 460.51 billion) revenue loss. Upstream firms provided Rs 14,430 crore (Rs 144.3 billion) and the remaining Rs 5,621 crore (Rs 56.21 billion) was absorbed by OMCs. Petrol prices have risen Rs 10.44 per litre this fiscal in eight instalments. 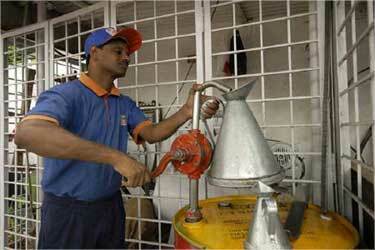 Petrol on April 1, 2010 had cost Rs 47.93 a litre while today it costs Rs 58.37 per litre. 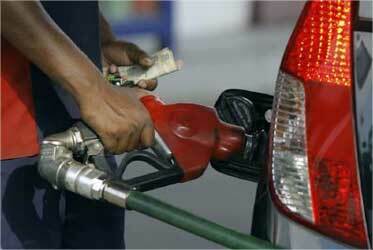 Diesel prices are however lower at Rs 37.75 a litre as compared to Rs 38.10 per litre on April 1, 2010. Fuel consumption is projected to rise by 4.74 per cent to 144.35 million tonnes current fiscal from 137.8 million tones in the previous year. During April-December, the consumption was 105.268 million tonnes.